Not all mammals have tear ducts, the tubes that regulate and distribute tears to the spaces between the eyeballs and eyelids. Rabbits and goats don't have tear ducts, as well as all aquatic mammals. Although only humans can produce emotional tears, animals produce tears to moisturize the cornea and wash away any irritants that may be present. For land mammals, a lack of tear ducts means their tears rarely provide relief from dryness or obstructions. No matter how many carrots a rabbit eats, he’s always going to be prone to eye problems. 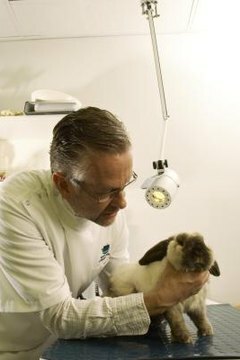 A rabbit’s lack of tear ducts makes him high-risk for bacterial infections, eye abnormalities, dry eyes and eye traumas, such as cornea scratches. Watery eyes are the first indication that your rabbit is suffering from an eye problem. Contact your veterinarian immediately if you notice a string of white mucus discharging from your rabbit’s eyes, as this may indicate a more serious issue, such as a bacterial infection. Seals have great eyesight, but no tear ducts. Their large eyes aren’t prone to serious infection because they moisturize their eyes each time they dive beneath the water’s surface. In fact, a seal’s eyesight is even keener under water, where he hunts fish. Both on land and in the sea, a seal is mostly unaffected by his lack of tear ducts -- it's more of a physical attribute than a hindrance. Without tear ducts to regulate the flow of his tears, they’re often seen streaming down his face, winning him favor with humans who find sentimental appeal in the look of a crying animal. Goats have especially unique eyes. Not only do they lack tear ducts, they also have horizontal rectangular pupils. Some people may find a goat’s eyes startling, because his horizontal pupils stand out against his brightly colored iris. Others find a goat’s eyes fascinating because they allow him to see almost all the way around himself, as well to have very detailed, 3D periphery vision. Unfortunately, like rabbits, goats are prone to some common eye problems. Their lack of tear ducts leaves them unprotected against debris in the air, such as seeds or hay. They’re also prone to less serious issues, such as inverted eyelids. Contact your veterinarian if you notice any excessive watering, bruising, discharge or eye damage. Water mammals, such as whales and dolphins, don’t have tear ducts because they don’t need them. As with seals, the water refreshes the eyes, keeping them moisturized and clean of debris. Although whales do not have tear ducts, they do have eyelid glands that produce oils to keep eyes moisturized. This is due to the huge surface of a whale’s eye. A whale’s giant eye requires more moisturizing than other sea creatures. What Animal Has Three Eyelids?